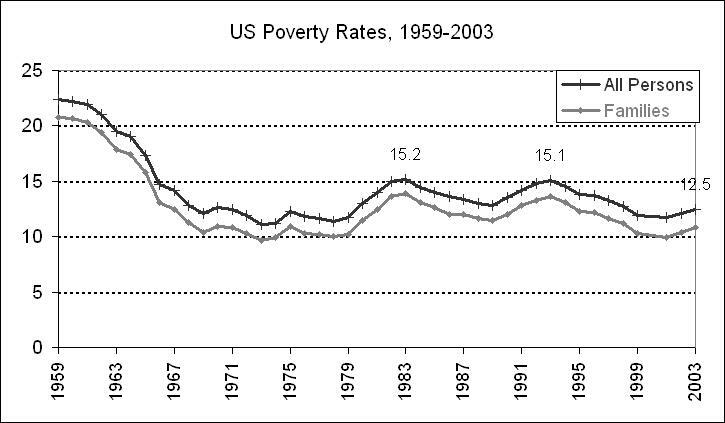 In 1964, President Lyndon Johnson declared a war on poverty, and the Great Society marshaled its resources to bring economic justice to the world’s richest nation. 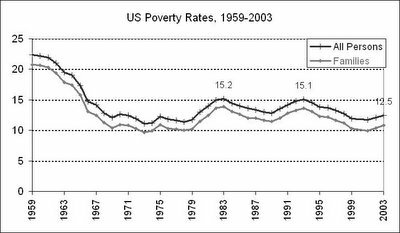 For the next decade or so, poverty rates began to fall, but beginning somewhere around the time of the second Nixon administration, when Americans began to doubt that government could do anything good, they stopped their steady decline. Then, after holding steady during the Carter years, they began an upward tick through Reagan-Bush I, reaching a high point in 1992. Under the Clinton Administration, they went back down again. 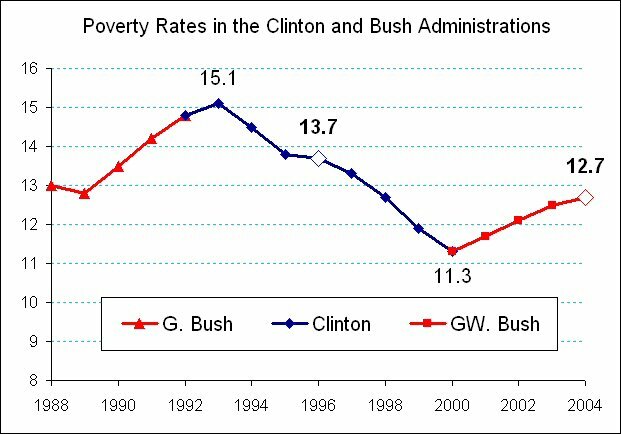 Then along came the current Bush II administration, and rates have taken a notably Reaganesque upward path. Expect that to continue if Bush’s proposed budget becomes law. Domestic programs (except “Homeland Security”) are cut by $182 billion over the next 5 years, including $36 billion in Medicare, nearly $14 billion in Medicaid, and billions in cuts to education, nutrition, social services, and a host of other programs that work. Of course, these “savings” are offset by tax cuts of $285 billion over 5 years, with the benefits helping to lift millionaires out the poverty of millionaire-ism. People with incomes of one million dollars will get a $600 billion peace dividend from the end of the War on Poverty. While feigning concern over the state of American education, the President has proposed cutting federal education spending by 29 percent, cutting student loans and grants and gutting vocational education spending. 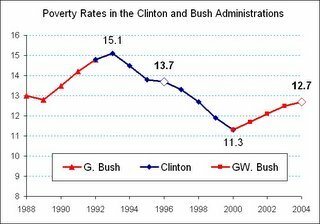 After reducing spending for health care for the poor, Bush wants 19,000 fewer poor children enrolled in Head Start. 470,000 elderly people, and families with children will lose food packages provided through churches and community food banks because the President would eliminate the Commodity Supplemental Food Program. Cuts to the Food Stamps program will knock 300,000 low-income parents and children in working families off the rolls. Changes in eligibility for free school lunches will leave behind 40,000 low-income children. Vital community services (often run by faith-based and local non-profits) for abused and neglected children and the aged will be cut, because the Social Services Block Grant is cut by 30 percent in one year, from $1.7 billion to $1.2 billion. At least 400,000 fewer children of the working poor will receive child care assistance between now and 2011 on top of the 250,000 children who have lost child care since 2000. Watch for the end of a host of other community services that help poor families, like the Low Income Home Energy Assistance Program (LIHEAP), employment and financial literacy education, emergency rent assistance, job training, nutrition education and other vital services because the budget eliminates the $670 million Community Services Block Grant. This is not a budget that reflects Christian values. This is not a budget that reflects the values of a society which once successfully battled poverty. This is a budget that is immoral, un-Biblical, and anti-America. It deserves to be booted off Capitol Hill by the representatives of the people. Whether it gets what it deserves or not is largely in the hands of people who will benefit from its enactment. That’s not good news for the poor or for America. We need to prepare for the Baby Boomers and start cutting back on government spending. I think Bush’s budget did not go far enough in trimming government coffers.In about 10 – 15 years, there will be no way that we can afford to pay for Social Security, Medicare, and Medicaid.We could radically increase taxes. However, this will cripple future generations. We can increase the budget deficit. But it will lead to serious systemic risks to our economy. We should reduce benefits promised during a previous era of prosperity in our country. Of course, we can try a combination of all three, but we would be left with a situation akin to eurosclerosis.We must make the painful choice of reducing benefits and reshaping Social Security, Medicare, and Medicaid to care for the very neediest in our country. It will be hard, but the demographic trend is inexorable.Reality shouts that this is not a Republican or Democrat issue. Arron.Your points are interesting but I feel flawed.Social Security can be fixed by 1 very simple step: All we have to do is remove the tax cut off. If all persons are texed the same, without reguard to income (the rich pay the same percentage as the poor) there may no longer be a SS shortfall.Now Medicare and Medicaid are a much bigger issue because the cost are rising more due to delivery cost, than consumption increeses. The whole medical system is nearing failure due to cost. It is impacting private industry even more than government. This can only be fixed, not by tinkering with or cutting these programs, but by addresing the health care system as a whole. Something that should have been done 10-15 years ago.